Enough with the autumnal melancholy! Enough with cheerless and sad glances through the windows! Enough with the resignation when you realize that this year is beginning to draw to a close! 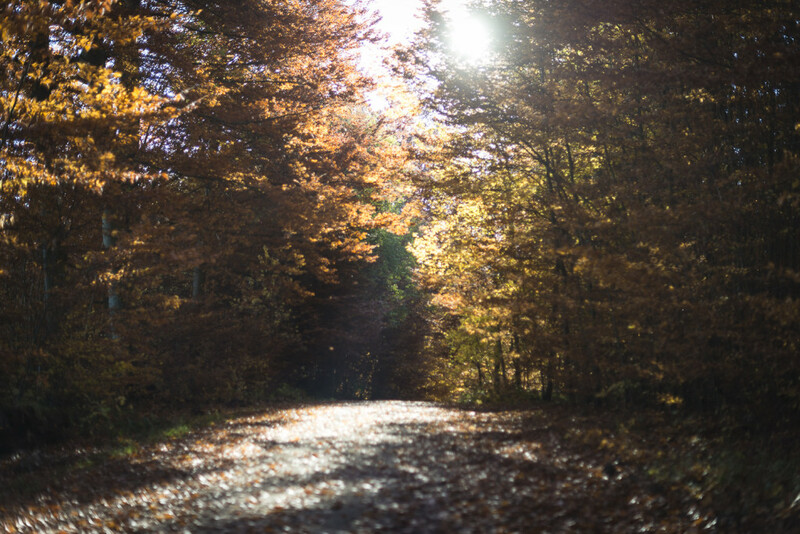 It is Novembre – the month of the last golden sunbeams. The almost-end of the delicious mushroom season and the beginning of the long awaited venison season. The month with beautiful star falls of autumn foliage, warm sunny afternoons and also the first misty and lazy evenings on the couch. It’s this month, when we finally can smile at the long-forgotten staple of book again, with a glass of red wine in one hand und a comfy blanket; a cuddly pillow in our arms, with our favourite person by our side. So many hobbies (left unattended during summer) await me, that I almost find it difficult to choose. 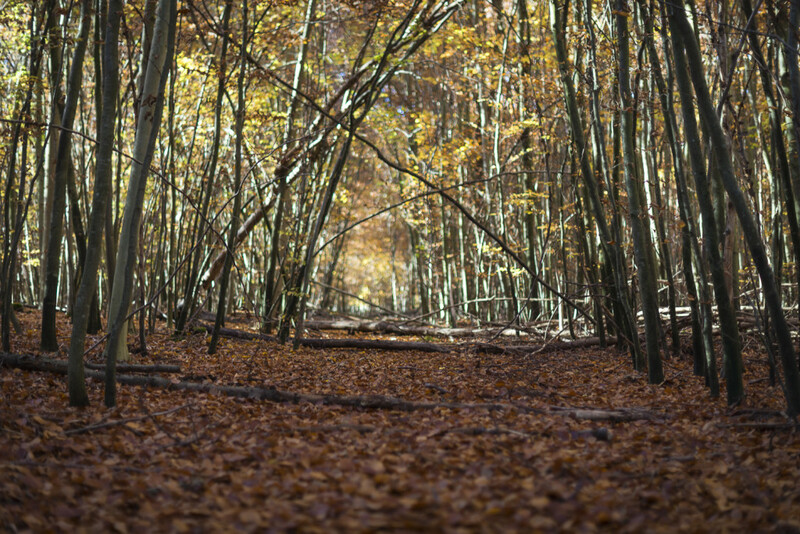 But today the sun is shining so wonderfully… so let’s go into the forest again! To inhale the autumn air and catch those precious spots of light between the trees with our freckles. The wind blows away the spiritlessness and the melancholy and makes us feel alive again. Autumn has come! 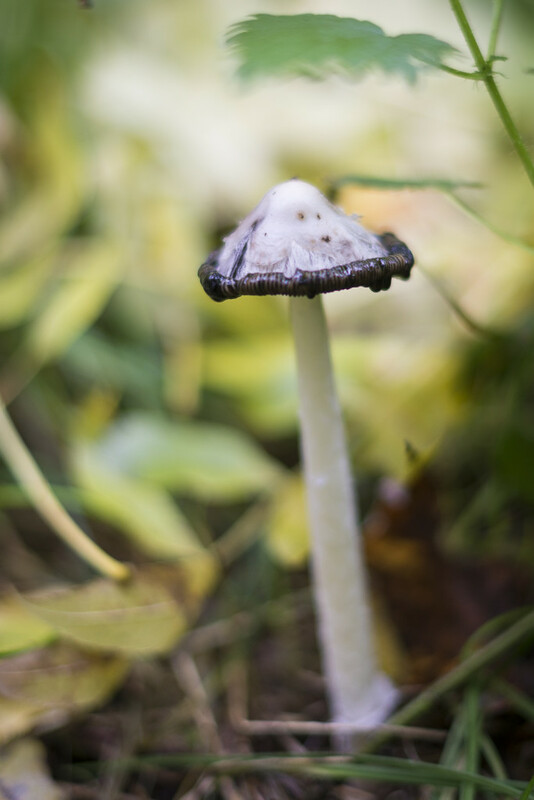 And maybe we will find one or two of my most favorite mushrooms on our way: The shaggy mane mushroom. Shaggy mane mushrooms are a delicacy. And sadly very short-lived, why we will never be able to find them on the farmer’s markets or in supermarkets. As soon as they start to show their caps between the fallen leaves, they are ready to be picked up. If not done so we can almost watch them how they start to compost themselves: The cap will part from the stem and curve outwards until it finally begins to turn into thick inky black liquid that drops down. Not very pretty and the dripping indicates the mushrooms have surpassed their lives as edible fruits of autumn. 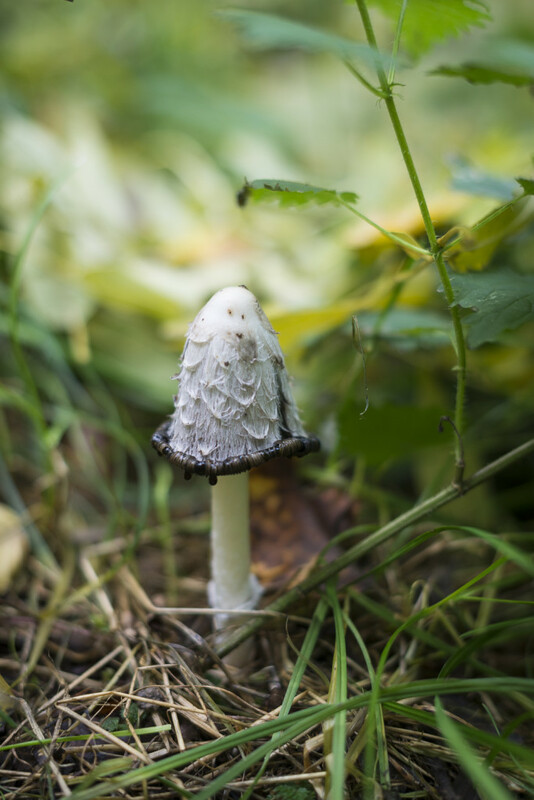 The three photographs of this single shaggy mane I took within tree days, all about 24 hours apart. 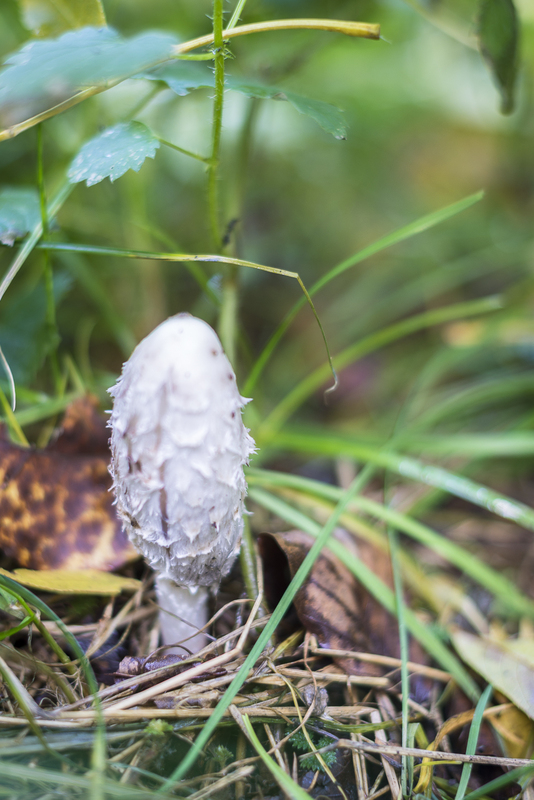 But if you are lucky and spot a freshly grown shaggy mane… gently pick it up with a careful grip and a twist of the hand. Also it is best to immediately remove the stem in the same way so your mushroom will definitely survive the way back home. And there you should directly get a pan, because yes: They really start to decay very quickly! 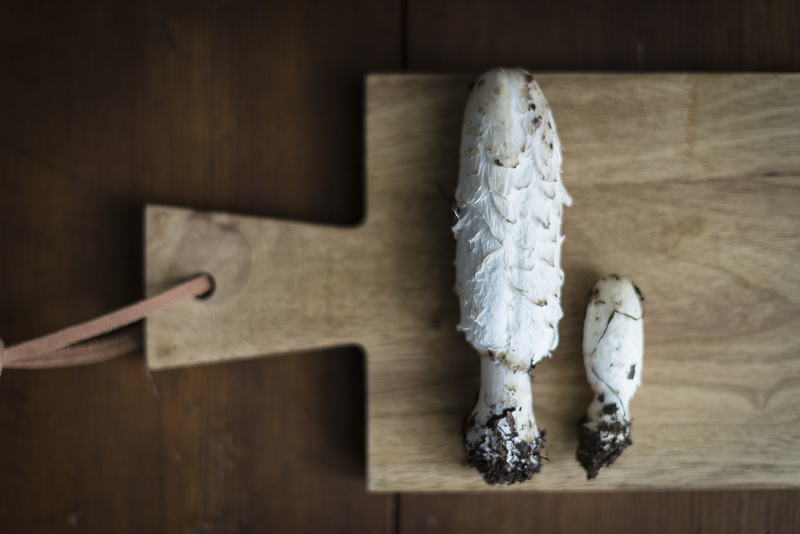 Like almost every mushroom the shaggy manes are best when you simply fry them very shortly over high heat and in a generous amount of good butter. A little bit of salt and pepper on top, maybe a little thyme and a slice of roasted bread to that is all you need for a little bit of luxury in your belly. Carefully clean the mushrooms of dirt and remains of the forest. Do not wash them or they will turn soggy. Just use your fingers or a gentle brush without crushing the mushroom. If you haven’t already removed the stems of the mushrooms gently twist them to separate them from the caps and cut everything in bite-sized pieces or chunks. Put a big pan on the stove and heat it thouroughly. Add the butter and when it starts to sizzle and almost smokes it is time to add the mushrooms. 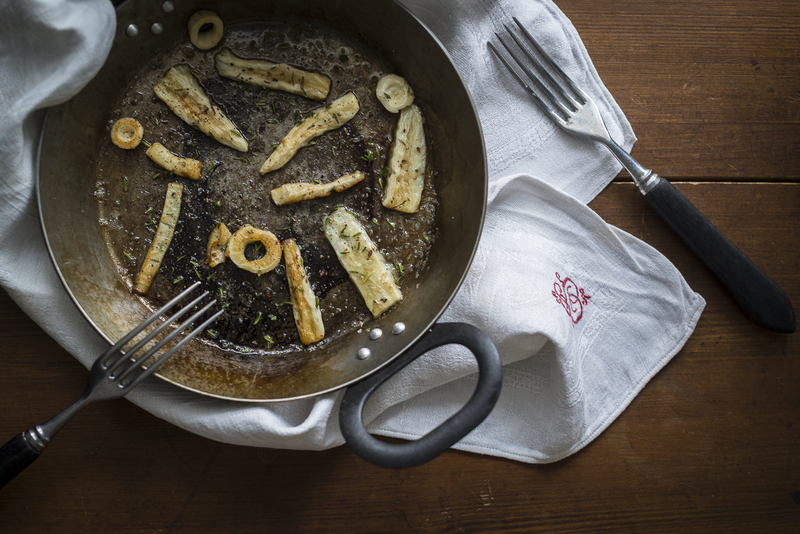 Do not crowd the mushrooms: They should have space in the pan so they can turn brown and crispy within a minute. Gently flip them over to fry them from the other side, too. Season them with a little bit of salt and pepper and some thyme if you want. Serve quickly and best with a slice of golden roasted bread. Shaggy mane mushrooms taste like a wonderful mixture of porcini and green asparagus. The flavour is very mild and still remains for quite a time. A real delight! You can find them on meadows, all the time between March an Novembre, and even fertilized lawns in residential areas are a likely place for them to grow. You can recognize them by a tall, slim growth, a reddish or brownish offset tip on the otherwise almost white cap, that is covered with upturned scales. When you pick mushrooms in the woods always be aware of evil twins! Shaggy mane mushrooms for example have a twin that is edible too but that’s poisonous when eaten with alcohol. Always be sure to pick only those mushrooms you definitely know are edible! Go to mushroom counseling if you are just the slightest bit unsure. Always double-check to be certain or just let it be completely and buy pre-selected mushrooms, if you crave for them! Life is too precious and short to eat a bad mushroom.